Five years ago, archaeologists uncovered a graveyard dating back to the Middle Ages in the Scottish city of Edinburgh. Now a research project to analyze almost 400 people who were buried there has revealed new insights into their lives and even how they might have looked like. The bodies of almost 400 men, women and children dating as far back as the 14th century were found on the site of a previously unknown section of the South Leith Parish Church’s graveyard during preparation work for Edinburgh Trams in 2009. Leith was the port for Edinburgh during the Middle Ages, and is now considered part of the modern city. The dig discovered 302 complete or near complete burials with fragments of at least a further 100 individuals recovered. The remains date between 1315 and 1638, with 90% of the remains belonging to people who died before they reached the age of 35. Thirty-two percent of the burials were children. Among the adults, the average height for females was 155cm (5ft 1’’) and for males 169cm (5ft 5.5’’). Strontium and Oxygen Isotopic Analysis of a sample of 18 bodies indicates that around 80% spent their childhoods in the Leith or Edinburgh area. The remaining individuals grew up within a radius of 25-50km. One burial one dated between 1426 and 1516 provided possible evidence of women dying in late pregnancy or as the result of child birth, with the remains of neonate bones found across the pelvis. Richard Lewis, City of Edinburgh Council’s Culture Convener, said, “The unearthing of such important remains was a major discovery five years ago, but to be able to gain an even closer insight into Leith’s medieval past is incredibly exciting. John Lawson, City Archaeologist, added, “This is one of the largest and most important urban excavations of human remains undertaken in Edinburgh and Scotland in recent years. The results have shed new light on the lives of the Medieval population in one of Scotland’s largest and most important ports. “It has allowed us to highlight the lives of the ordinary person in Leith, by putting a face to these individuals and showing how they lived and died. 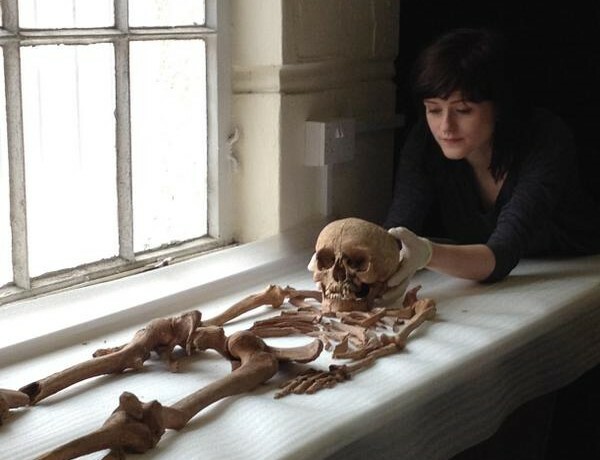 The forensic reconstructions have really helped to identify these remains as those of members of the public, rather than merely deeming them as archaeological remains, and how alike they are to modern day inhabitants of Leith and Edinburgh. A team of experts from the University of Dundee have also reconstructed the faces of some the people. By using forensic modelling to determine the shape and depth of facial muscles and soft tissues, isotopic analysis to ascertain individuals’ origins and state-of-the-art computer programming, researchers were able to build up lifelike facial representations for the 400 to 600-year-old remains. Amongst the reconstructions was that of a boy, aged between 13 and 17, who was thought to have lived around Leith and Edinburgh and to have died in the late 14th or early 15th century, an adult male aged 25 to 35 who lived in the mid 16th to 17th century and a woman also aged between 25 and 35, who died in the late 14th and early 15th century. Professor Caroline Wilkinson from the Centre for Anatomy and Human Identification, University of Dundee, explained, “The MSc Forensic Art course has been running for eight years at the University of Dundee, and over the last few years a fruitful partnership has been built with the City of Edinburgh Council and the Museum of Edinburgh.